Did Russian Parents Scare Their Children with The Story of Baba Yaga? Let’s Celebrate Month of July in Russia With These Beautiful Festivals! What Are The Festive Months In Russia? Get To Know Here! Have you ever heard of Russian medovik cake? Let’s find out here! What is Like The First Day of Spring in Russia? 12 Most Iconic Food Brands From Russia You Should Know! What Do Russians Eat for Their Daily Breakfast? Here are the Answers! 13 Iconic Russian Books To Read Before You Die! Russian Hair Tips! How to grow your hair faster! How To Do Make Up Like Beautiful Russian Girls? Here Are The Tips! How Russian people celebrate Epiphany? For History Lovers, Here Are Russian Medieval Historical Fiction! Greatest Russian novels everyone should read right now! How To Find Perfect Time For Learning Russian Language? 8 Finest Libraries in Moscow, Russia. 11 Ridiculous Myths About Russia That Most People Believe In. Top 9 Beautiful Places In Russia That Worth To See! 7 Natural Wonders In Russia That Will Stun You! 9 Beautiful World Heritage Sites in Russia you should visit! 10 best historical spots in Russia that will stun you up! 11 Most Hipsters Places in Russia Suitable For Hangout. 5 Famous Place in Moscow, Where Are They in Russia? 4 Best Time to Visit Russia That Every Traveller Need to Know! “Hет” and “Не” = The Difference of it’s Functions and Usage. Facts and History of Russian Language That You Must Know! How to show time expressions in Russian? The History of Russian Ballet That Will Amaze You! There are some hidden facts among the most beautiful metro stations in Russia. There are one of the things that you must try if you happen to visit the country with an amazing winter wonderland. Moreover, Russian metro stations are not your typical means of transportation but also a display of history and culture in the Russian past. You can travel through outstanding famous places in Moscow. There are many Russian icons, include the famous Red Square and famous landmark around it, that worth to see. In addition, you can enjoy the fashionable Moscow street style and enjoy many interesting that the city can offers. American and British Metro stations inspire Russian metro stations. Russian first open they’re first ever working metro in Moscow. However, the Russian metro is very different than metro from other countries. You can discover some of the most beautiful metro stations in Moscow. Exploring the city with metros also means are walking the Russian most famous gallery that portrays Salin architectures. Moreover, the mosaic decorations, halls with chandeliers, and impressive statues will surely amaze anyone. Moscow metro stations have been taking people by surprise with its beauty, but not many really know the stories behind it. They describe the different era of Russian breathtaking history of metro stations in Moscow. Here are some of the hidden facts about from Moscow metro stations past and present. The Moscow metro stations are one of the busiest stations in the world. Many Russian a traveler use this cheap and reliable means of travel. Moreover there more than 150 billion rides on Moscow alone. It transports about 2.4 billion people per year, slightly below Japan with 3 billion people per year. An amazing hidden fact about these stations is it is the world record-holder for on-time departures and arrivals. In addition, their time accuracy equals 99.99 percent. A very impressive record that the interval between trains during rush hour is only 90 seconds. Therefore, you can literally miss your train if you come late. In many of the walls of the Moscow metro stations, you can easily spot mollusks shells, coral, and other similar fossils. They originated millions of years ago and part of the design in more than 20 stations. However, you need to really pay attention to marble on some walls to really capture them on sight. this hidden facts about the metro remain hidden among the walls. Overall, they are more than just beauty but also a combination of a Geological and Paleontological museum. When a train moves to the city a male voice announces the stations, but when it enters toward the suburbs, announcements are made by a female voice. However, in terms of circular lines, the principle is when the train moves clockwise a male voice is used, and when it moves counter-clockwise it switches to a female’s voice. Moreover, this different voice usage is done in order to help blind people. There is some incident where workers stop construction due to a disagreement between designer and city government. However, during World War II the construction of several stations did not cease. In addition, there are seven new stations built under the wartime. Hidden facts about the metro station in Moscow that still in debates are their astronomical value. Astrologers say that the Moscow ring line has 12 stops which represent the entire zodiac sign. Moreover, they are all related beautifully. There is a hidden secret metro among the metro stations in Moscow. Metro-2 is the name for a secret underground metro which parallels with the public Moscow Metro. It is supposedly operated under the guidance of the Russian Ministry of Defence. Moreover, the rumor says the weight of this secret hideaway exceeds that of the public Metro. In addition, it is said to have four lines and to connect the Kremlin with the Federal Security Service headquarters. It is understandable if you can’t remember their long and hard to pronounce metro stations names. The many of the Moscow stations changed names several times. For example Alexandrovsky Sad had many names, among of them are “Ulitsa Kominterna,” “Comintern,” “Imeni Kominterna” and between 1946-1990 was known as “Kalininskaya.” Moreover, to make things more confusing, this station names change into “Vozdvizhenka.” for several days. Many of the metro stations in Moscow have amazingly decoration with giant impressive metal or stone statues. Moreover, it represents heroes and great people in Russian time. Among them are the partisans, soldiers, Lenin, and Pushkin. In addition, many people believed these statues can bring luck to the people who touch it. Therefore, some parts of some statues have a different color, due to human contact. The most famous statues superstition is rubbing a metal rooster with your hand and wishes for better health or more money. Moreover, while you’re admiring the statues, also enjoy other amazing trinkets include the murals, glass-work, chandeliers, and mosaics are equally beautiful. There is a legend about the Moscow metro stations circle line. There is no plant to build such line the origin project. Legend has it during the construction Stalin put his cup of coffee on the metro map. It left a brown spot around the city center. However, it gives Stalin idea to make an additional line. Therefore, he showed the circle to the builders and ordered the construction of such a circular line. That is way brown represent the circle line and that is how the circle line ended up in the map. 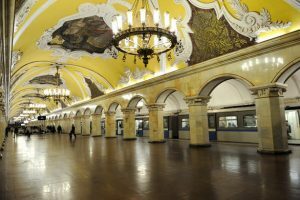 Moscow metro stations enhance their security systems by adding CCTV. It also announced the subway plan to test an intelligence system to reduce suicides and accidents. The new safety system’s special sensors notify train drivers in cases when a person goes too close the rails. Moreover, it is an adding feature that enrichens long list of great things about metro stations in Moscow, Russia. *Jika artikel ini bermanfaat, mohon di share ^V^!